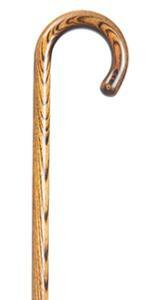 A very traditional, very elegant hardwood crook walking stick made from honey-coloured acacia wood. The crook handle enables the cane to be hooked over the arm when not in use. The shaft tapers and is fitted with a rubber ferrule. Available in a ladies' height (3212) of 88cm (34.5"), and for gentlemen (3213) at 92cm (36"). Item weight is 175g / 385g.